I LOVE St. Patrick’s Day!! Probably has something to do with the 50% Irish that’s in me! It was always celebrated in our home when I was growing up…. our grandma would send us St. Paddy’s cards with little gifts and we would have the typical Irish meal- corn beef, potatoes, cabbage… YUM YUM! Anyways, these past couple weeks I’ve been busy coming up with some easy DIY St. Paddy’s decorations. Here’s the first of a few I will be sharing! 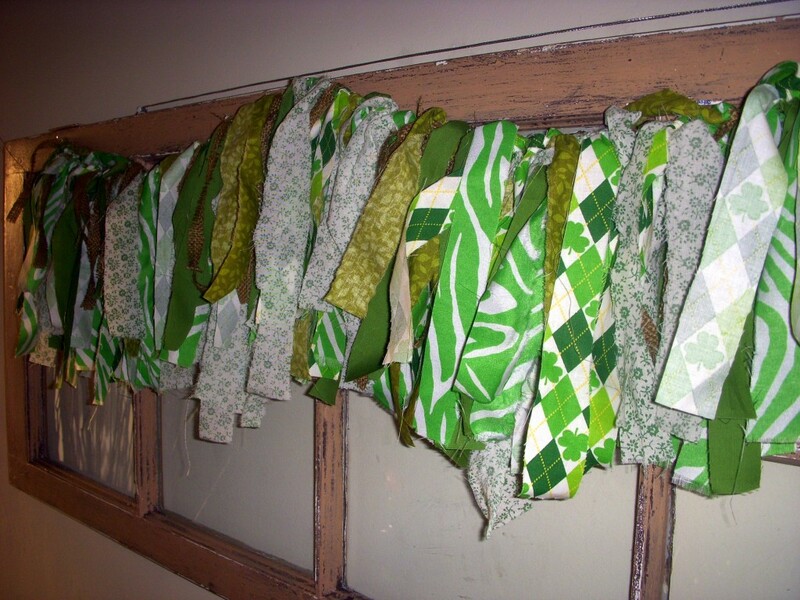 I made this St. Paddy’s garland and I think it’s a great addition to the window for this LOVELY green holiday! I will be the first to say that I think it looks like something you might find in Anthropologie… Can’t you just see this on one of their wooden walls, or above a dresser in their bedroom-design area, or even above one of their cool claw-foot tubs?!?! If you disagree, we can agree to disagree!! I told you here that I’ll probably be decorating this window with every holiday and I have yet to miss a holiday!! I am currently patting myself on the back as I type this post :) This garland was SUPER easy and fun to make! You can make this garland using any color scheme and put it anywhere in the house (ie. bathroom, nursery, master bedroom). I made this while watching TV one night…. probably some fantastic episode of the Real Housewives of some-city!